Berardino Gentile first appears in the Painesville, Ohio, area in 1904. Berardino Gentile, son of Giovanni Gentile and Maria Carmina D’Orazio, was born on March 6, 1880, at Frosolone, Italy. He married Maria Carmella Russo at Frosolone, Italy. Berardino Gentile first immigrated to the United States on March 10, 1904, at age 24, travelling to Painesville, Lake County, Ohio He was joining his brother-in-law, Michele Arcangelo Cardegna in Painesville. Berardino is shown as re-entering the United States on October 21, 1913, at age 33. He was travelling to Troy, Rensselaer County, New York. The ship manifest indicated that Berardino lived in Columbus, Ohio, from 1905 to 1910. 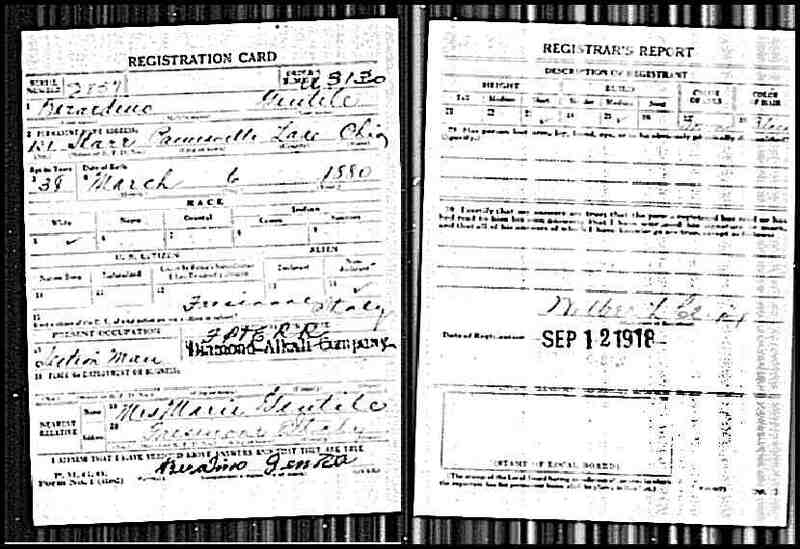 Berardino Gentile registered for the World War I Draft on September 12, 1918. He was living at 121 State Street, Painesville, Lake County, Ohio. Berardino was employed by the F.P. & E. Railroad Company. His wife was living in Italy. Berardino was enumerated for the 1920 Census of the United States, on Jan 13, 1920, living at 131 Storrs Street, Painesville, Lake County, Ohio. His name was recorded as Valentino Gentile. Berardino probably returned to Italy in the 1920’s. Three of Valentino Gentile’s siblings lived, at some time, in Painesville. His sister, Maria Orazia Gentile immigrated to, and settled in Painesville in 1906. His brother, Nicola Gentile, lived in Painesville in 1905. Four of Nicola’s siblings settled in Troy, New York: Cosimo (1874-1953), Filomena (1876-1914), Francesca (1883-1960), and Lucia (1888-1933).